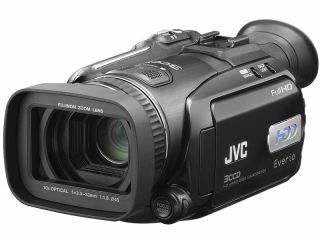 JVC has blamed tough market conditions in the US and Europe for a dramatic fall in sales and operating profit its third financial quarter. The company says that it's been particularly badly affected by poor CRT TV and D-ILA projector sales in the US. It had also been affected by the elimination of its DVD recorder range and poor audio system sales. Sales of blank media - CDs, DVDs and digital video tapes - had also fallen, JVC said. Sales turnover was put at ¥205 billion down from ¥240.5 billion; operating profit was down to ¥0.7 billion leading JVC to post a net loss of ¥1.4 billion. On a positive note, the company said it had seen an increased demand for its hard disk camcorders and LCD TVs in Europe and the US, but even here the company had been affected by the falling prices on both products. JVC says it expects trading conditions to remain difficult for its final quarter. It blames this on increased competition, the impact of 'runaway oil prices' and growing concerns for economic slowdown in Europe and the US.